Met Beau Bassett at the bike camp. He is riding from Washington to Santa Cruz, stoping at high schools to talk to them about community service programs. Very interesting guy. The day started out misty but them got dry through Seaside and Cannon Beach. Had lunch and did laundry at Cannon Beach. Once over Arch Cape it was foggy and wet again. Had to go through a noisy tunnel. Pretty hairy. At the end of the tunnel there were a couple of cyclists stopped. Elenore and Nick are from Portland just doing a couple of days riding. They took the bus to Astoria and will take one back from Tillamook. They both work at a co-op in NE. While we were talking Beau caught up with us. After the tunnel were a couple of big climbs and descents. There was road construction and the flaggers held the cars and let the bikes go through alone. It would have been very scenic but it was socked in fog. Eventually all 4 of us, at different times, arrived at the very nice hiker/biker camp. We had a nice fire and stayed up relatively late. Forecast is for better weather tomorrow. 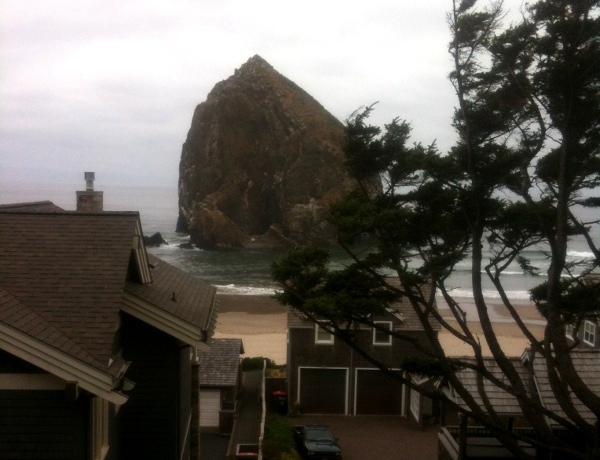 The famous Haystack Rock near Cannon Beach.